Destiny Station is a large military outpost spaceship, whose mission is to patrol the fringes of inhabited space. Destiny Station's main task is to protect the colonies in its territory from attack. Recently, there have been kaiju incursions into this sector of space, and a team of mecha has been dispatched to aid Commodore Calvin Cole. The Merry Marauders, led by Major Marion "Mary" Grossman, have only recently arrived. While Commodore Cole has welcomed their presence, Colonel Stephen Harding, commandant of the Destiny Station's fighter wing, has already been less than enthusiastic in helping the mecha team integrate into the military structure. 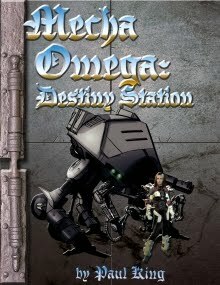 Mecha Omega: Destiny Station is the Modern20 add-on to Mecha Omega, providing new NPCs, occupations and feats for Mecha Omega written using the Modern20 rules. Destiny Station also includes new mecha equipment suitable for any OGL campaign using Mecha Omega. In short, no matter what rules you use for Mecha Omega, there's a little something for you in Destiny Station.